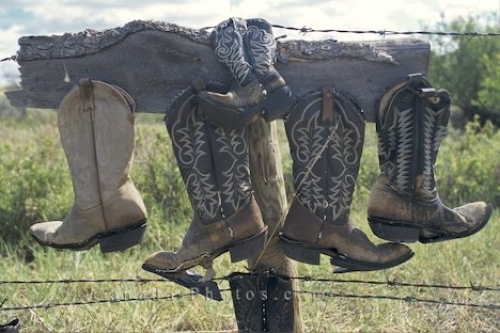 Cowboy boots hang from a piece of wood that is attached to a wire fence in Saskatchewan, Canada. After a good pair of cowboy boots have been thoroughly worn, the people passing by this wire fence hang their boots to this wood alongside a wire fence in Saskatchewan, Canada. The real reason these boots are hung here is unknown, but it leads to an interesting topic of conversation. cowboy boots, Saskatchewan, Canada, North America. Picture of an assortment of cowboy boots nailed to a strip of wood in Saskatchewan, Canada.